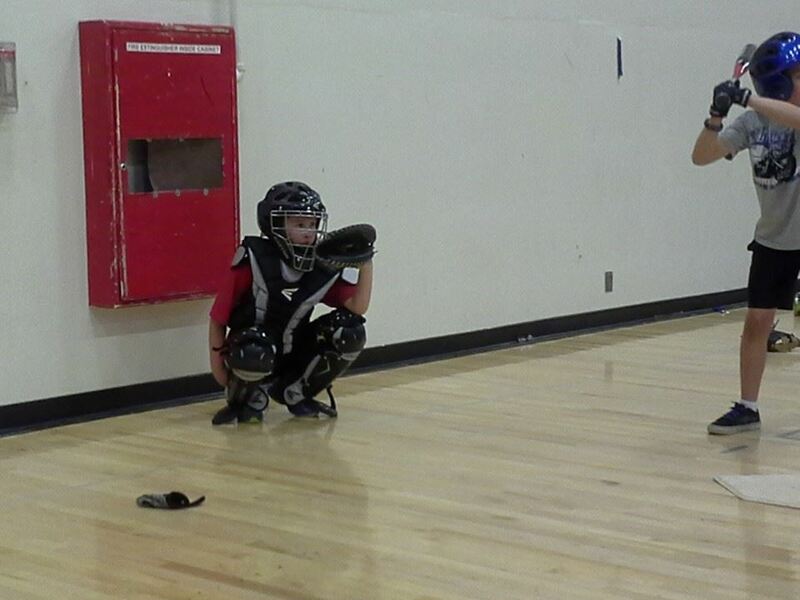 Timmy the catcher…again. His new coach’s son is also a catcher and his coach works hard on training them on techniques. Yep, I’ve been scarce. 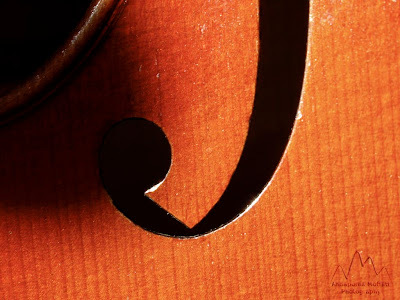 I’ve been spending more time on my Facebook fan page than here, because I can pop up quick discussion items and engage with friends and fans that way. The Colorado Springs Pioneers Museum is in the old El Paso County Courthouse. This museum reminded me of the Old Florida State Capitol. 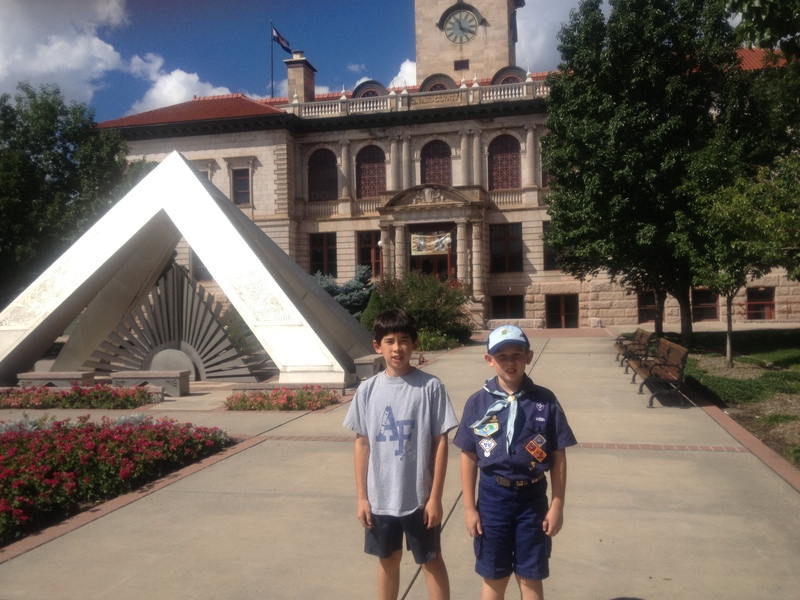 For a Cub Scout field trip, in mid-September our family visited the Colorado Springs Pioneers Museum in the heart of downtown. The museum is free of charge (donations are always welcome), and has numerous artifacts from Colorado Springs’ past and current histories. The interior of the museum is beautifully maintained, and most of the courthouse rooms have been repurposed into individual exhibit spaces. A couple of the rooms are still in tact as courtrooms and are used as multi-purpose auditoriums. During our visit we saw exhibits about the Waldo Canyon Fire of June 2012, the city’s Native American heritage, the history of the Colorado Springs area being used as a popular location for sanatoria, as well as a history of the city as told through photographs taken at the time. The museum is located at 215 South Tejon St. in downtown Colorado Springs. Museum admission is free, but you have to pay to park either at the parking meters immediately surrounding the property, or else at the public parking garages nearby. Enjoy a few pictures from our visit. Just before I took my October trip to Nebraska the family did a Cub Scout Family Camping Event near Defuniak Springs. This is our 3rd time going to a Fam Camp event, so this time around the family could be more laid back. 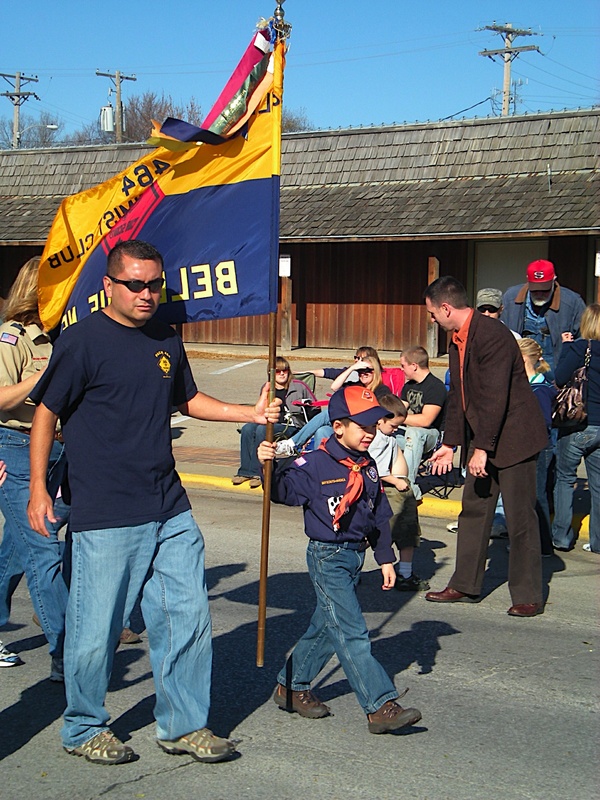 The Cub Scout family camp experience includes the same activities: fishing, swimming, boating, leathercrafts, archery, BB guns, model rockets and lots of hiking. Our pack included a night hike and a game of lightstick tag after dark. 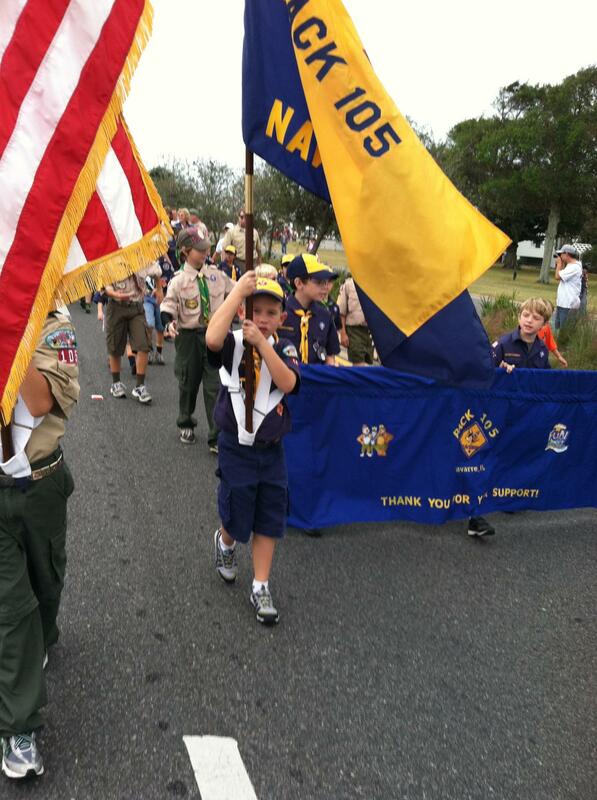 The scouts can come and go as they please, and the entire family can participate, even siblings! 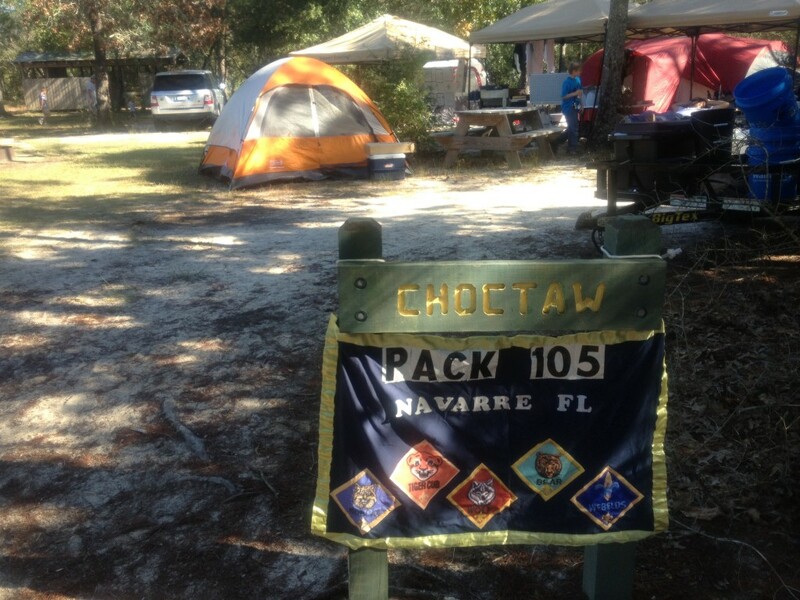 2 weeks later, while I was in Nebraska, Dave took the boys back to Defuniak Springs for a “Webelos Weekend”. Jacob is a Webelos-rank Cub Scout, and this weekend was designed for the scouts to earn from numerous activity pins. 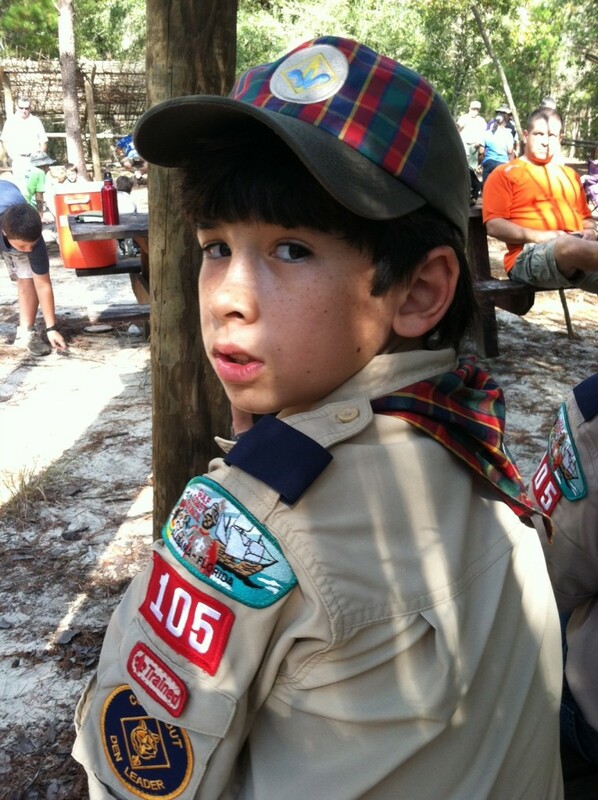 Jacob earned two activity pins in one day during the weekend. 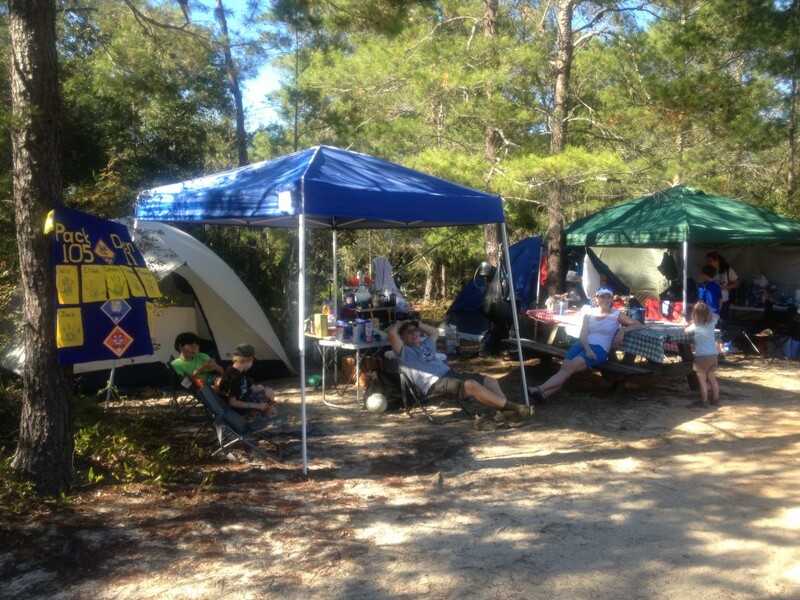 Our camp setup. The weather was really wonderful, so even though we just got a screen wrap-around for our shelter, we didn’t need it all weekend. 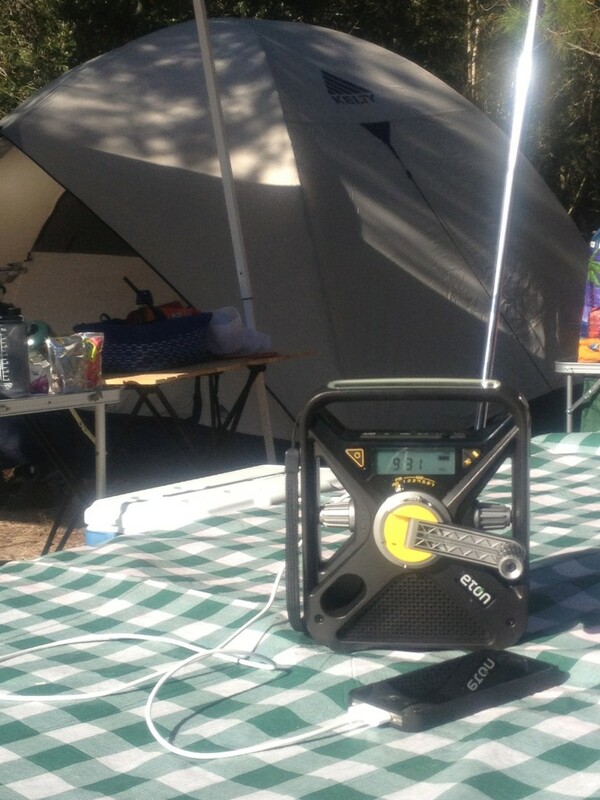 I was testing hand-cranked/solar powered emergency radios by Eton Corp. for GeekMom. This one included a cell phone charger, it’s truly a for-emergencies-only charger. We could get about 2% charge on the phone. 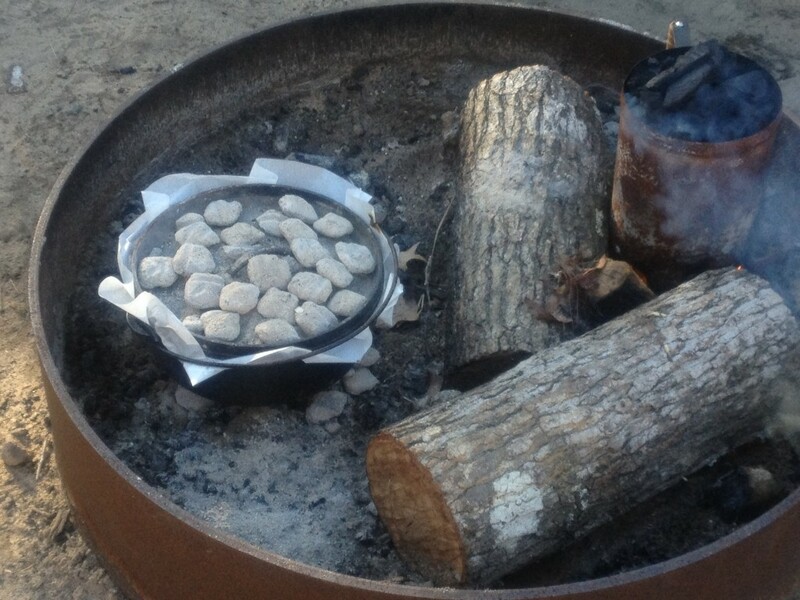 Fam camp isn’t complete with Patricia’s latest Dutch Oven cooking experiments. The first night’s dessert failed miserably (a peach cobbler that didn’t set). This is a chicken and rice casserole turned out really well. The finished meal. 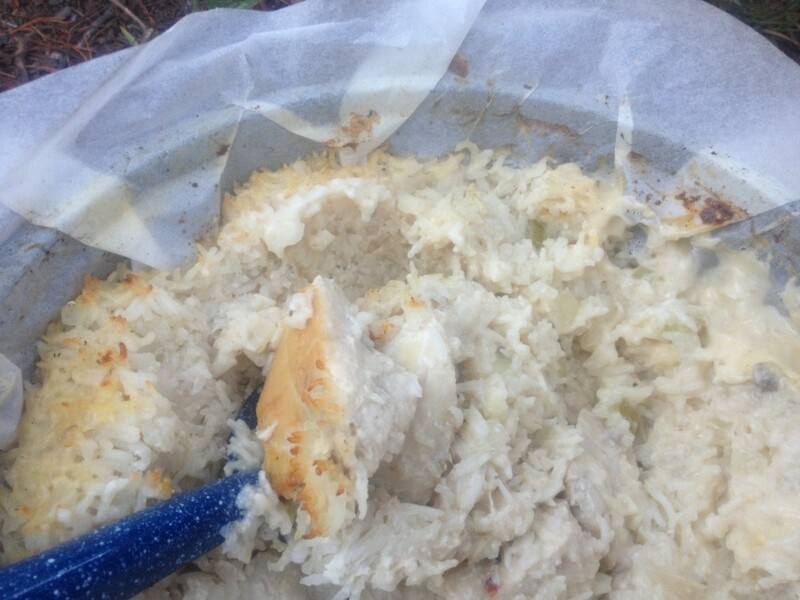 Here’s the recipe: http://papadutch.home.comcast.net/~papadutch/dutch-oven-recipe-chickenrice.htm . 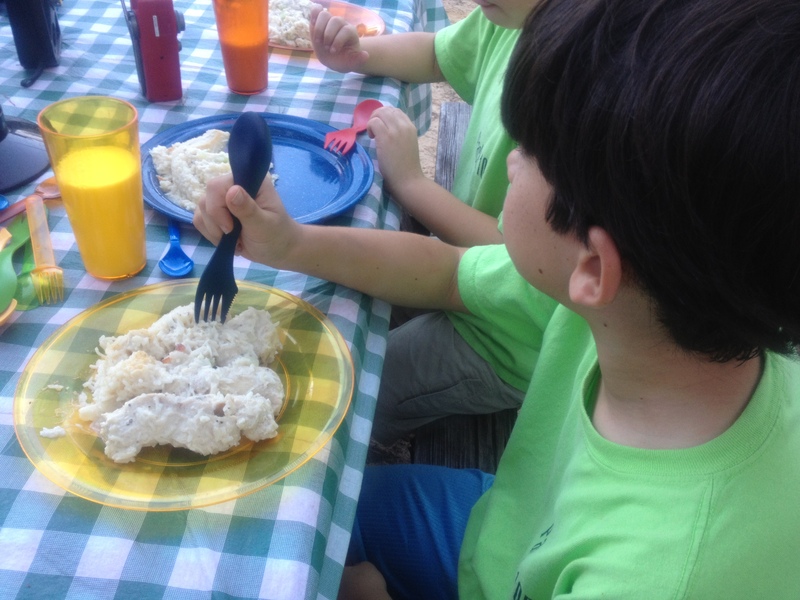 Unfortunately, now that our sons eat adult-sized portions, the 10″ diameter Dutch oven is ending up too small. It might be time for a larger one. The recipe was designed for a 12″ Dutch oven and things were VERY full in the one I had. 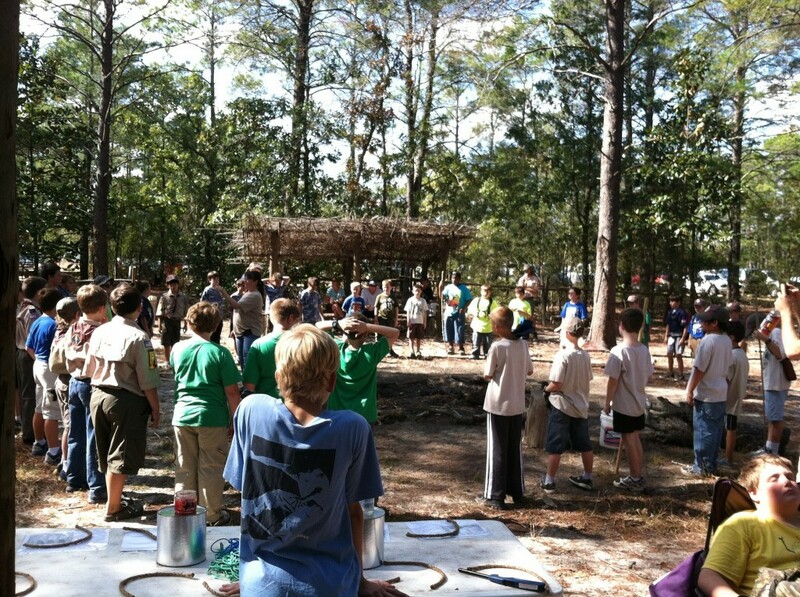 The Family Camp tradition is a huge bonfire on the Saturday night of the event. Everyone gathers for skits and music. 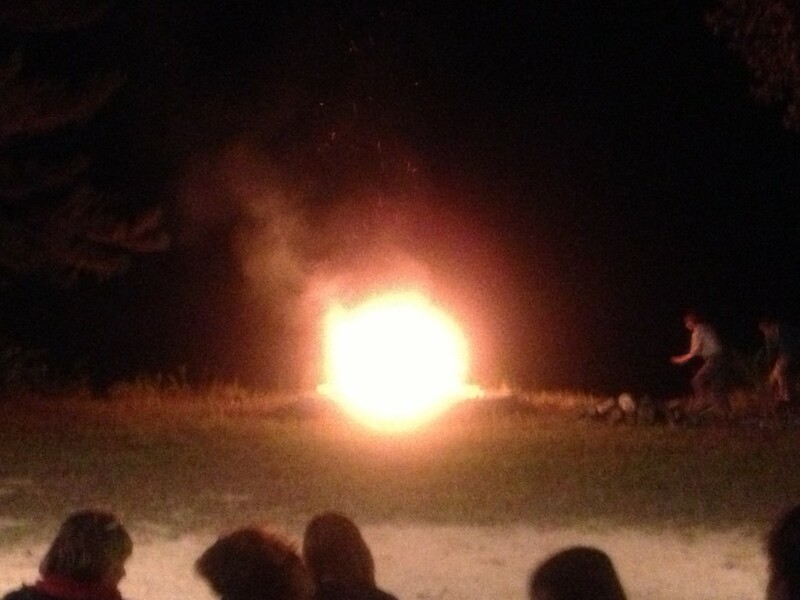 The fire was ENORMOUS! The kids enjoyed the skits a lot. 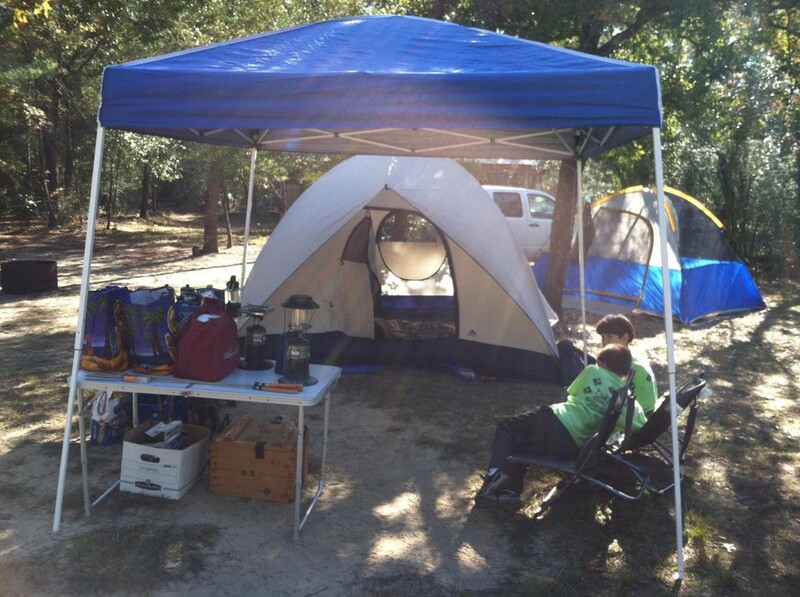 This was the setup from Webelos Weekend. Dave and the boys did this with NO HELP FROM ME! This is from the opening ceremony. Jacob is towards the back on the left, facing us. Pensacola went without a minor league baseball team for a season while this ballpark was under construction. 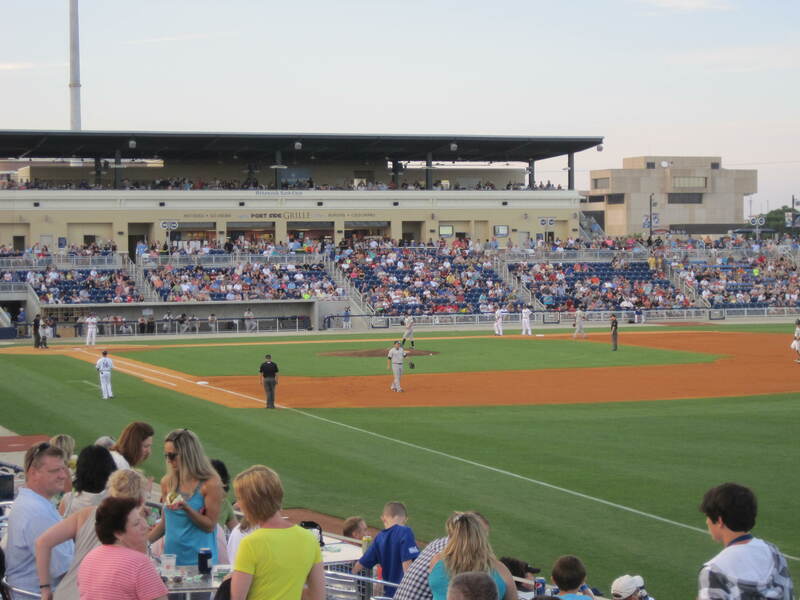 This the Blue Wahoos' inaugural season. After a day of the boys playing baseball, we headed out to downtown Pensacola for an evening with the Pensacola Blue Wahoos — the city’s brand new AA Minor League baseball team. They had a team called the Pelicans until 2010, but for summer 2011, there was no professional baseball in the area. We’re excited to have a team to watch locally now. 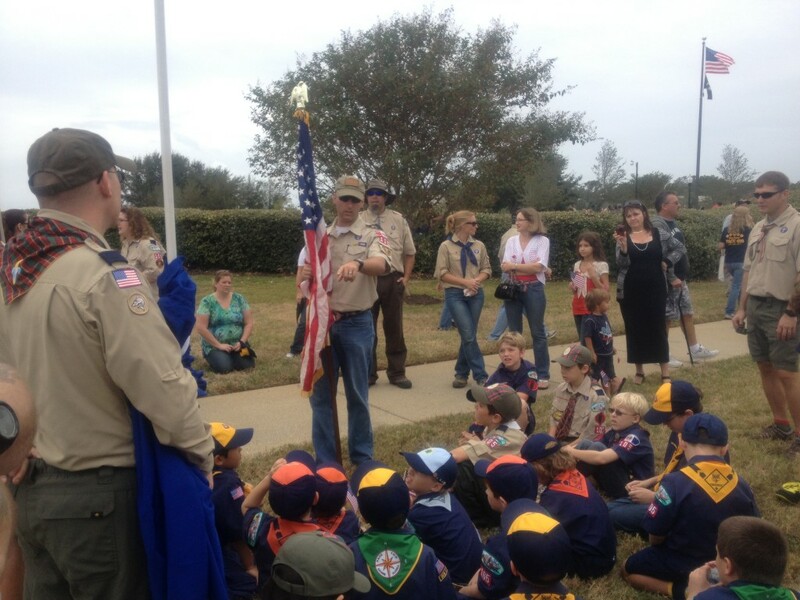 About a month ago, the local Boy Scout Council announced that May 5th was “Scout Night” with the Blue Wahoos. Unfortunately, the first two months of games was were nearly sold out and even within an hour of receiving the announcement about Scout Night, I couldn’t get 4 tickets together for the family. So I went ahead and got two sets of two tickets. 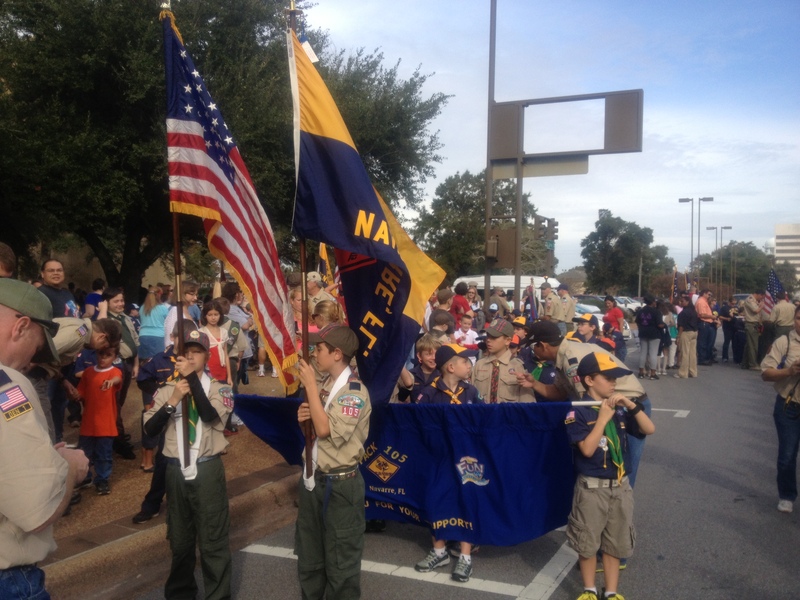 There was a Scout parade at 6pm but we didn’t get to the park in time. Instead, we chose to stop for dinner. Hello friends! I have a lot to talk about — but I need time to sit down and just do it. 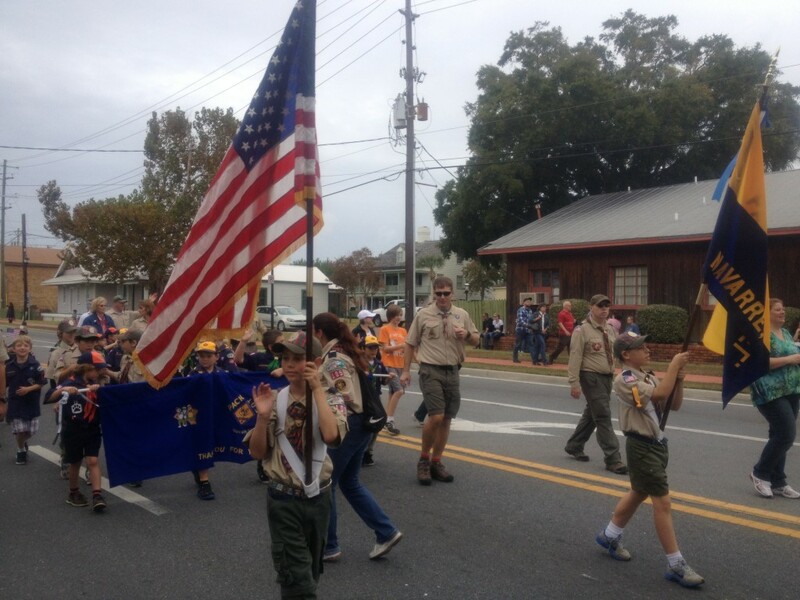 Things have gotten pretty busy here…between my involvement in the base Spouses’ Club and Cub Scouts, I’ve been spending more time with community work than ever before! The boys started baseball a couple weeks ago (both boys), so that’s been keeping us busy too. Their season will start after spring break. No pictures yet, but I’ll get some soon, I promise! 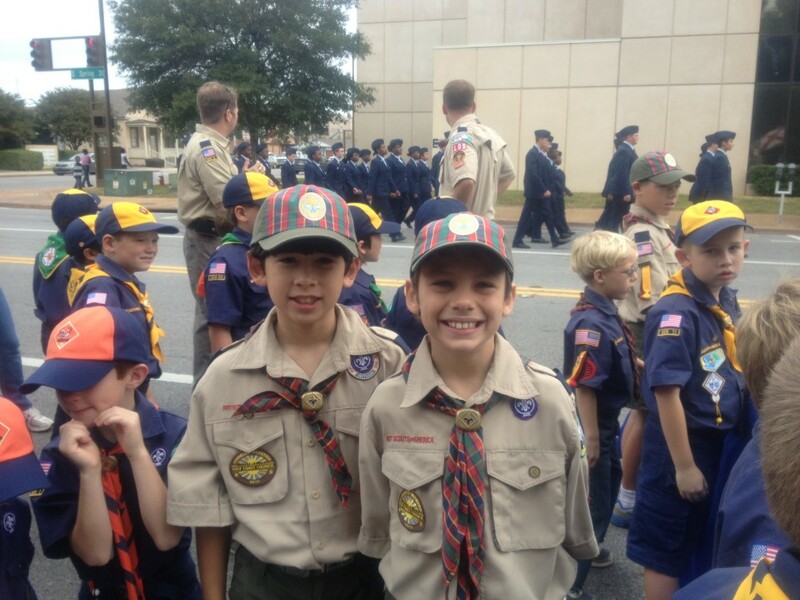 Both boys earned their Cub Scout badges in February. We are so proud! 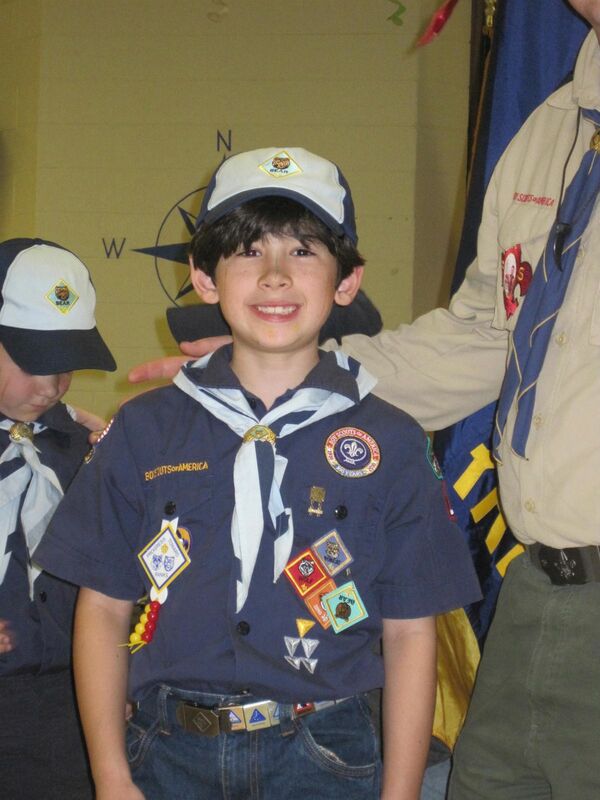 Timmy’s face is painted as part of the ceremony for earning the badge. The orange square badge is pinned on upside-down until he does a good deed. Jacob’s face is painted too, but you aren’t really see it. 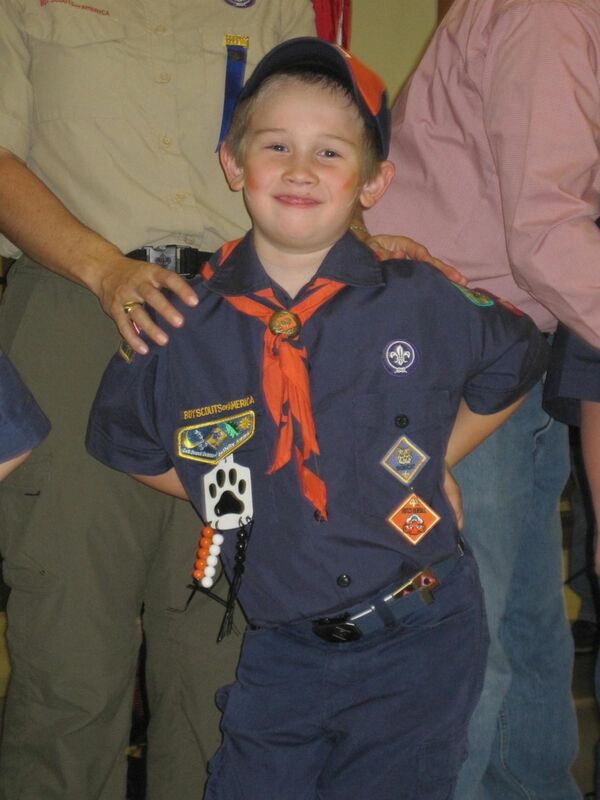 Jacob’s light-green badge is upside-down until he did a good deed. Dave’s back surgery recovery has been continuing. He was cleared at the beginning of February to resume exercise and he’s been slowly working back up to his Air Force fitness running requirements. I think he and Jacob could run a 5K together by May! I’m hoping they can do the Sunset Stampede! The boys and I did the run last year and it was a great time! If you are either Dave’s or my Facebook friends, you will already know about our latest diversion — a new car for Dave! 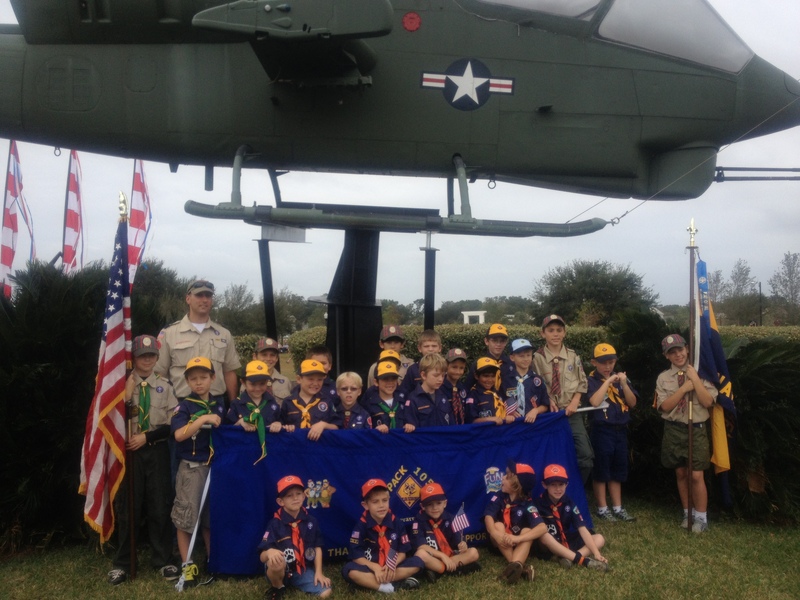 For those who might not have realized, not long after we moved to Florida, Dave began looking at a “fun” car to enjoy on his 15-mile U.S. Highway 98 commutes between Navarre and Hurlburt Field. I had convinced him that our household budget would appreciate his waiting about a year, which he patiently did. So we spent much of February shopping for a convertible. Between a nearly $10,000 trade for the Prius, and Dave keeping his search to a used model, this turned out pretty reasonable. We looked at used BMWs, used Ford Mustangs and new Mini Coopers. I want to thank my sons publicly for their tolerance of road tripping all over Pensacola, Crestview and Fort Walton Beach, test driving and sitting patiently while the grownups talked to the car dealers. 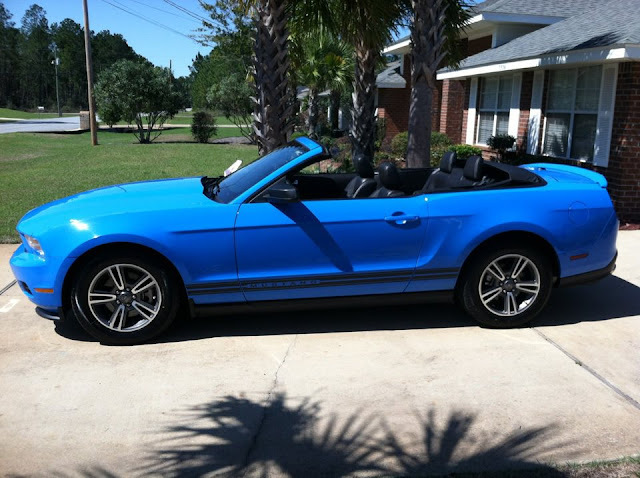 Dave was particularly interested in a 2011-or-newer Mustang V6 for its exceptional mileage. The very next day, Dave let me drive the new car with my friend Stephanie to Walt Disney World to run a half marathon (for another post), and after that weekend, the weather was absolutely LOUSY. San Francisco-type fog rolling in waves from off the Gulf of Mexico for FIVE DAYS! Starting this past Sunday, it’s been BEAUTIFUL and worth while to have a convertible. We can’t wait till this spring! So there’s a brief update on our lives — keeping up with our jobs, the kids and our community. 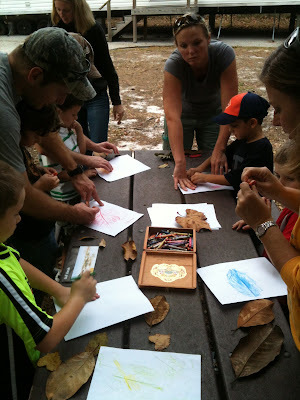 You know that picture from yesterday where I showed the kids getting interviewed for the Pensacola News Journal? They led off on a small online story today! Here’s the picture below, and here’s the story! Enjoy! PS: I’ll give a Dave update tomorrow. Hurrying to get this published before midnight!